Our gummy bears candy is a menagerie of irresistibly adorable, brightly colored, squishy and delightfully flavorful gummy bears. Just opening the bag and seeing the bears will make your inner child smile. Your kid's faces will light up when you give them these tasty bears for snack. Gummy candy is an ideal example of how pleasing simplicity can be. Corn Syrup, Beet Sugar, Gelatin, Sorbitol From Fruits & Vegetables, Citric Acid, FD&C (Yellow #5, Yellow #6, Red #40, Blue #2 and Blue #1), Natural and Artificial Flavors, Vegetables Oil, and Carnauba Wax To Prevent Sticking. So yummy cant stop eating them. I have to agree with the others in that these gummy bears are top-notch, full of flavor, and have a great chewy texture. I’ll be buying more…and preparing my stomach…lol! Delicious! Eat these more then I should. Absolutely the best gummy bears ever! They have 12 distinct flavors and I love every one of them. The texture of the bears are nice and gummy, but not too gummy. They are softer than the ones that you usually get prepackaged, and much higher quality. 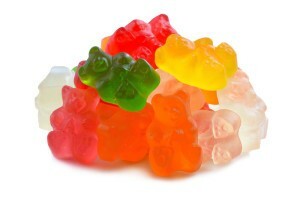 There are no better gummy bears to be had anywhere, these are the most flavorful and have the perfect texture to them. I have never made a better purchase in my adult life and will be buying these again and again! These were the BEST gummie bears I’ve ever had! They were super flavorful and the texture was amazing….Just what a “gummie” should be. I would recommend these over any gummie out there and I’ve had them on a trip to Europe…these exceed those! Thanks Regal! The best gummy bears I’ve ever had! They have great texture & you can identify each individual flavor.